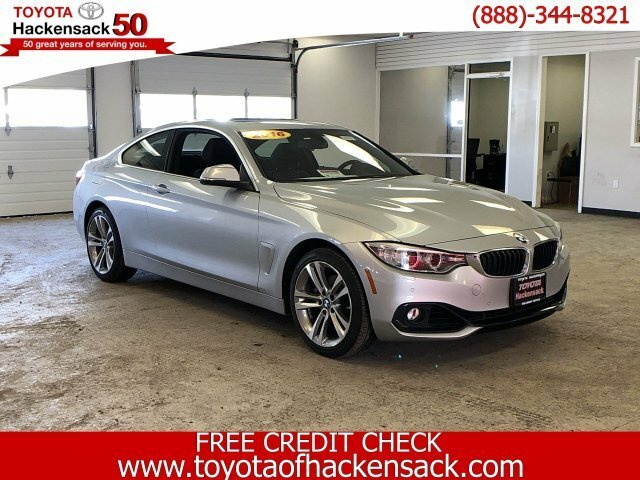 Glacier Silver Metallic 2016 BMW 4 Series 428i xDrive AWD 8-Speed Automatic 2.0L 4-Cylinder DOHC 16V Turbocharged Packages Cold Weather Package - ZCW Retractable Headlight Washers Heated Front Seats Heated Steering Wheel Driver Assistance Package - ZDA Rear View Camera Park Distance Control Technology Package - ZTP Head-UP Display Navigation System Advanced RTTI Remote Services Bmw Online And Bmw APPS Instrument Cluster Sport Line - 7AC FINELINE Anthracite Wood Trim Sport Seats, Advanced Real-Time Traffic Information, BMW Online & BMW Apps, Cold Weather Package, Driver Assistance Package, Head-Up Display, Heated Front Seats, Heated Steering Wheel, Instrument Cluster w/Extended Contents, Navigation System, Park Distance Control, Rear-View Camera, Remote Services, Retractable Headlight Washers, Technology Package. The BMW 4-Series receives only minor changes for 2015. Much of the equipment of the Sport Line is now standard, including high-gloss black exterior accents, sport seats, and an Anthracite headliner. Also, both the Luxury Line and M Sport Line are no longer available, while a Track Handling Package adds 18-inch V-spoke wheels, M Sport brakes, adaptive M suspension and variable sport steering. The M4 also gets standard keyless entry and Harmon/Kardon sound.